Beautifully handcrafted earrings! Shipped promptly. 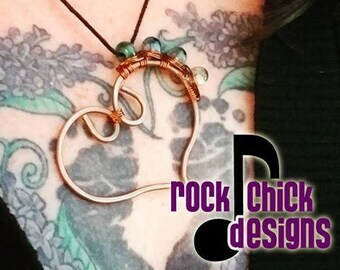 Twisted copper bracelet time in the Rock Chick Designs workshop! I'm making my own beads, now, in my Eureka, CA, glass studio! Made from the liquor bottles of kind and selfless friends. 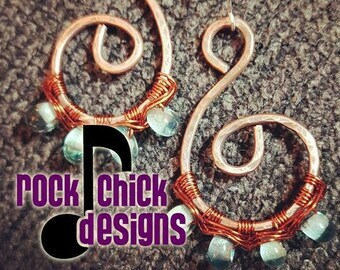 Salvaged copper electrical wire spiral earrings with recycled liquor bottle glass beads, made in Eureka, CA. Our first design -- used and broken guitar and bass string bracelets. Still popular after all these years. The crocheted cassette tape handbag, featured in the Wall Street Journal. The first Rock Chick Designs "banner," painted on well loved record jackets. Repurposing is kind of my thing. My shop started some years back after I'd collected some broken guitar strings from concerts and figured out how to turn them into pretty (and) rockin' bangle bracelets. Since then, it's expanded to include mostly wearable (or at the very least useful) music-, motorcycle- and alcohol-related items. My passion is repurposing -- giving new live to items that have already lived their originally intended life. Creative reuse makes fireworks go off in my head and my biggest challenge is focusing on my main inspirations (see above) without collecting every little unrelated thing my friends want to give me. Functional art (including wearable art) is my favorite kind of art. I'd hope that's clear when you look at my shop. I'm a crafty mama who splits my time between a day job, momming, coordinating a major local art event (North Coast Open Studios) and wearable creative reuse.